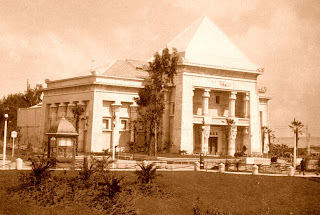 The Midwinter Fair's Fine Arts Building was designed in a pseudo-Egyptian style, and stood at the North-East corner of the Court of Honor. Built to house numerous paintings and other art treasures, architect C.C. McDougal used brick for the building's walls to make it as fire-proof as possible. The exterior of the 120-foot wide building was tinted a sandstone color, and featured a conglomeration of Egyptian columns, multi-colored sculpted panels, and hieroglyphs. The building's entrance was approached by a set of stairs, flanked by two sphinxes, and a massive central pavilion was topped by a pyramidal roof, with winged deities at the corners. The Fine Arts Building was probably the most noticed structure of the Midwinter Fair's numerous buildings, due to its original & unique design. At the end of the fair, the building became San Francisco's first municipal art museum, known as the Memorial Museum. Eventually, after construction of the deYoung Museum next to it, the building became obsolete. It was declared unsafe for use, and demolished in 1928. 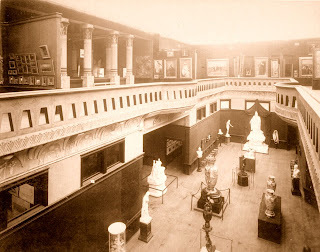 The former site of the building is now marked by two post-fair sphinxes and the massive bronze Gustave Dore vase, which was purchased for the Memorial Museum after the close of the fair.